Yesterday we put my father to rest, his ashes buried on the grounds of the vacation cabin my family has shared for almost 30 years. We put an inscribed rock up to mark the spot, and had a wonderful memorial service, with everyone present to speak on what a wonderful influence our father had been on us all. 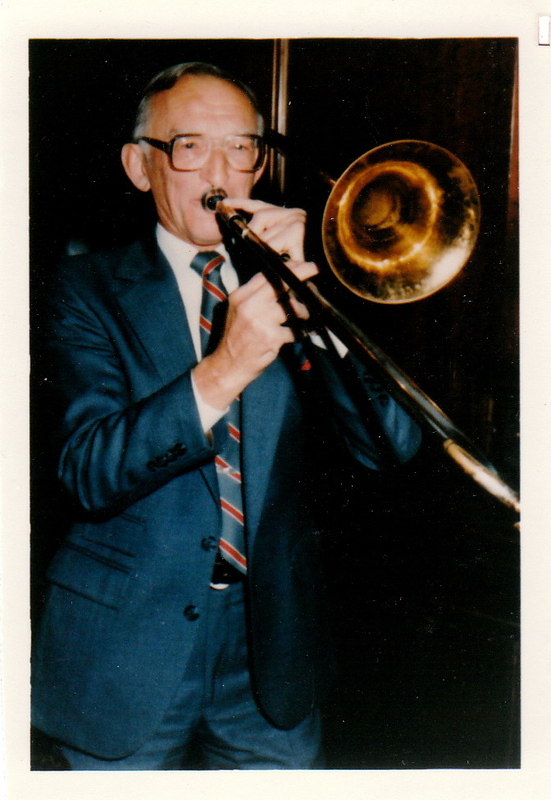 His life of almost 97 years was celebrated again and again, both through poems, testimonials, and music especially- since my father, Philip H. Bowers aka “Big Band Phil” was a lifelong musician and trombonist. I did a couple of songs for him, as did my sister Polly, with which we all sang along. The point of this all? Health is all about good family relations, good, real food, music and poetry! Of course, exercise is important as well, but there was almost too much of that going on, what with fallen tree removal, brush burning, and even when I carried the giant engraved boulder into the grave site! We miss our dad, that is for sure. But, with a life of nearly 97 years; really- how can sad you be about such a long, successful, happy life! I remember my dad, when his health finally really started to fail, and I went down to help out- he said to me, as I helped him walk into the bathroom: “I always told the truth, I never swore, and I paid my debts- and my mother even told me I was a good baby!” (I got a laugh out of that last, but I suppose it’s true…) He was wondering why he was experiencing pain, since he was not used to such, even at that advanced age. Don’t eat grains, and don’t eat processed foods. My parents never allowed “pop” into the house, and this is when everyone else did, back in the 1950’s and 60’s. Never. They did actually eat bread and low-fat dairy, but this was when everyone bought into this big lie- since they adopted it so late, it hardly affected them at all. My little siblings, well, I am their worst nightmare now, prosleltyzing to them night and day. They probably haven’t eliminated grains, but they are definitely minimizing them! Sleep a lot: my parents always made sure we were in bed by 8:30 each night- and this is when I was in high school, and subject to peer ridicule. I hated it then, but like it now! Stay together with your family, and your wife! What a novel concept, but as important now as it ever was. My parents were together for 67 years, and supported their 8 kids through thick and thin- they sent us all through college! My siblings and I are probably closer now than we were growing up, and I, as the eldest, am now 65. Embrace your creative side! Our “right brain” is every bit, and probably more important than our left brain. Ignore this creative, intuitive side of your brain to your own peril! Paint, do woodworking, cook, sing, dance, and write- your real, ancestral human side needs to come out to make you a fully realized human being! Your bankbook should definitely not be what defines you completely! Live in nature, and embrace the religious side of humanity! My mother is the most devote person I have ever known. My father, although not part of a standard faith, despite being raised Methodist, always told us all to “Embrace the golden rule- “do unto others”. Never lie. Never swear. (He never did either). This will rub many the wrong way, but it is as true today as it ever was regardless: “Do not rely on government for anything. Do for yourself! Reliance on anyone else is Slavery!” They both reiterated this over and over again, even though they grew up in 1930’s depression era America. Big Government is always ready to “help”, which they told us was simply “enslavement”. They were 100% right! Government is always ready to take what you have created, and “share it”, meaning to take it- giving a tiny fraction to those who will not work, and keeping the lion’s share for themselves, meaning the ruling elite! My father also did isometric exercise, along with pushups, every day of his life! Go thou and do likewise. Do these things, and you too can have a wonderful, long, fruitful and productive life. Honor God and humanity and Nature itself by doing the right thing as best you can. Ignore perversions like transgenderism, phony appeals to race, and just treat all about you as equal tribespeople, all of whom should be treating you in a like manner. If they don’t act in this manner? They are illegal, attacking hostile tribes of one sort or another, and should be dealt with. Exclude them from your tribe- they will destroy your way of life. Do not attack them, unless they attack you- make sure they live in their own “land”, a land of socialism, and other perversions. Then, they will reap what they sow, and will fail amongst their own mistaken choices: do not support them, and they shall fall on their own.